For 4,000 years, mankind used clay vessels to cook food. But that is all in the past. Goldens’ Foundry Cast Iron Cooker has left clay in the dust. Welcome to the future. Welcome to American-Made. 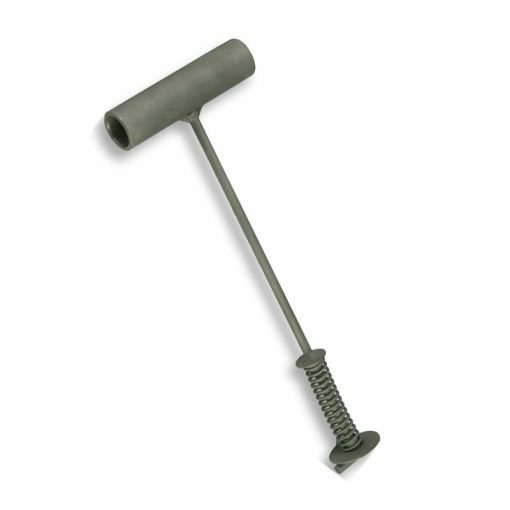 Welcome to rust-resistant, all-weather durability. Welcome to the two-minute sear and the overnight low-and-slow. Welcome to the last grill you’ll ever own. Clay has had its day, welcome to the Iron Age! 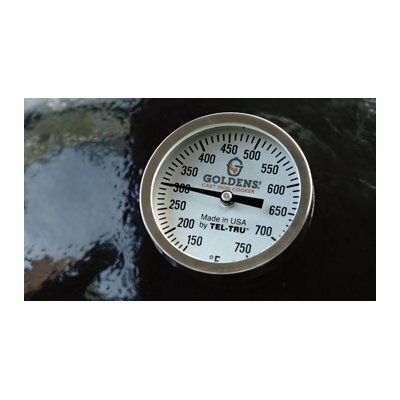 The Goldens’ Cast Iron Cooker is built on two beliefs: First, as a 5th generation family business, products should be built to last, just like our company; and second, while life may be fragile, your grill doesn’t have to be. For the past 137 years, Goldens’ Foundry & Machine Company has cast the parts that have helped build America. The Goldens 14-Inch Kamado Cooker is a travel and tailgate favorite! 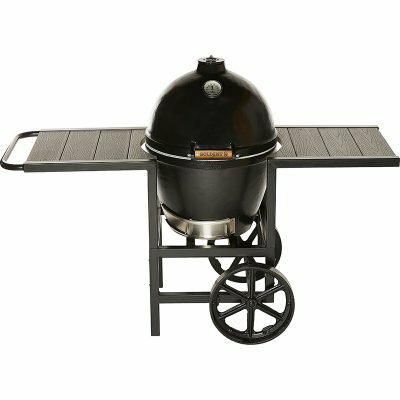 The world’s toughest and smallest cast iron cooker, smoker and top kamado grill. A smaller and more portable version of the 20.5″ Big Brother, the 14″ Little Brother mini-cooker grills, sears, smokes, roasts and bakes too! Take it anywhere! 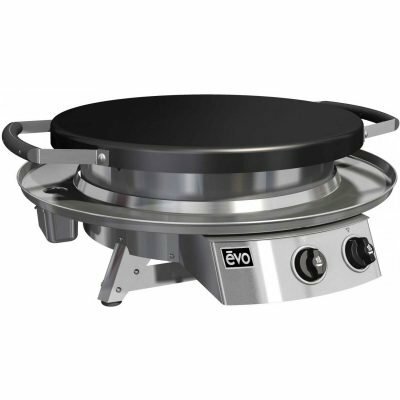 It’s also constructed of high-quality, durable American made 7/8″ cast iron with a full 14″ cooking area that will last for generations! Beyond durability, our cast iron surfaces offer amazing “flavorability” too! 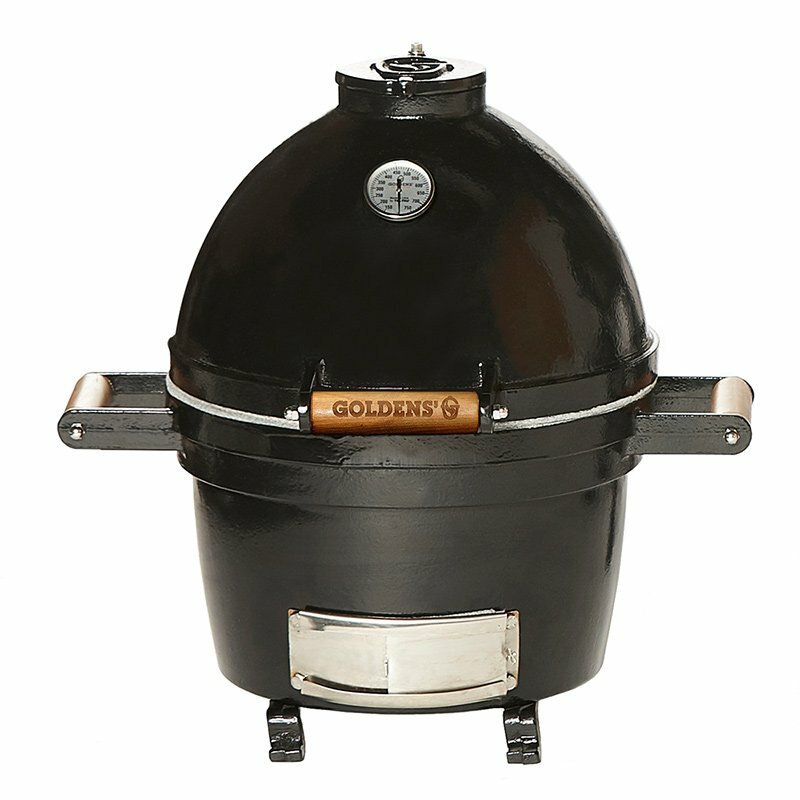 All Goldens’ Cast Iron Cookers are finished with an all-weather, high-temperature powder coat finish to prevent rusting and weathering effects. This model includes a full set of cast iron 14″ grates and grate lift tool. The Goldens’ Cast Iron Cooker will bring your family together for generations to come.